When Christopher Air’s mom went to change a £20 note so that the tot could try the toy game again, the tot took matters into his own hands. 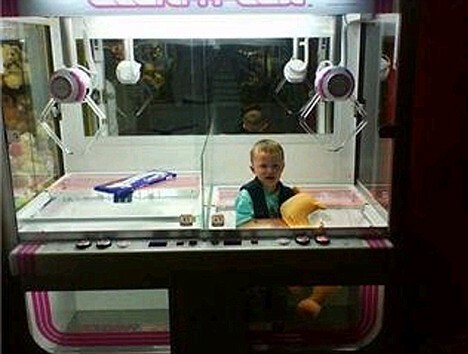 The smart 3-year-old spotted the flap on the machine, from where the prizes are delivered, and squeezed inside. Mrs Air said: ‘My back was only turned for a minute. When I looked around, Christopher was inside. ‘He’s good at solving problems. He obviously saw getting the teddy bear as a problem and getting inside the machine as the answer.’ For Christopher, at last united with the bear, it was the perfect solution… in the short term at least. The machine proved more difficult to get out, than in – especially as the arcade owner couldn’t locate the keys. After 30 minutes, he was released – and is sure to have learned his lesson. But, misguided as it was, his ingenuity paid off – the arcade owner gave him the bear to cheer him up.